South African Hindu and Christian leaders paid tributes to controversial Indian origin Muslim missionary Sheikh Ahmed Deedat, who had in earlier years earned the ire of both communities for his fiery attacks on the two religions. Durban, Aug 10 (IANS) — Surat-born Deedat, who was known throughout the Muslim world for his captivating talks on comparative religion in which he often quoted extensively from the Hindu and Christian religious scriptures, died at his home north of Durban Monday. Somewhat ironically, the missionary whose glib tongue had engaged in dialogues over decades with such world-renowned figures as US Protestant missionary Jimmy Swaggart of the US and the late Pope John Paul II had been completely bedridden for the past nine years and in recent years could only communicate through eye movements on an alphabet chart. Describing Deedat as “a great scholar of Islam”, Ashwin Trikamjee, president of the South African Hindu Maha Sabha, said his death was a huge loss to the religious fraternity in the country. Trikamjee said although Deedat had been controversial, he had made an immense contribution to the religious community. Anglican Bishop Ruben Philip said he regretted hearing of Deedat’s death, calling for continued dialogue between South African Christians and Muslims. Born in 1918 in Surat, Deedat came to South Africa with his father in 1927 and had to stop his schooling to start work as a salesman because of financial difficulties at home before finding his calling after reading a book on the work of Christian Missionaries in India. After starting up the Islamic Propagation Centre International (IPCI), Deedat found strong funding support from Arab countries for his lectures and debates all over the world to distribute a huge amount of Islamic literature and videos in several languages. Welcomed by leaders of virtually every Muslim country in the world with open arms, Deedat often found himself at the centre of controversy at home with his publications that Hindu leaders here believed at one stage could jeopardise the harmonious relationship between Indian Muslims and Hindus. Deedat had also been refused entry into France and Nigeria because authorities there feared that his fiery speeches could spark civil unrest between different religious communities there. 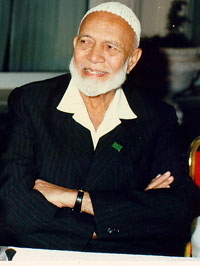 In 1986, Deedat was awarded the King Faisal Award by Saudi Arabia for his service to Islam.